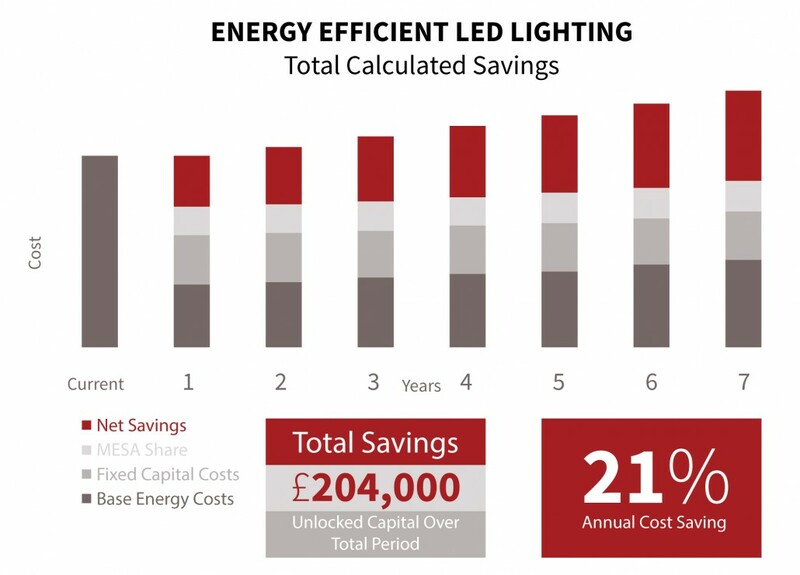 We recognise that businesses need to save energy and by financing a zero capital investment switch to our energy efficient LED lighting technology, we can guarantee you savings from day one! Because lighting is purchased as a service, there is no initial capital investment The improved LED lighting reduces the absolute energy cost and the ongoing service is paid for from the energy saving pot. Cutting energy costs has a significant impact on profitability with a 20% reduction in energy spend having the same impact on a company’s bottom line as a 5% increase in sales. Replacing outmoded, poorly controlled lighting will reduce energy usage by up to 80% thereby cutting costs and carbon emissions. LED Works is a Lighting Service is a ‘Pay as You Save’ Package whereby the energy saving generated by using LED lighting in place of conventional lighting is used to finance the purchase and installation cost of the LED lighting. There is, therefore, no capital cost to you, we provide the technology in exchange for a share of the energy cost saving over the term of the contract (typically 5-7 years). We have an affordable solution.. LED Works, is a Managed Energy Service Agreement (MESA) which is really simple and cost-effective way to upgrade to energy-efficient, LED lighting at no capital cost. It is ideal for any organisations with a significant investing in lighting: large building, multiple buildings or sites requiring a high level of lighting, be they industrial, commercial, leisure or retail sectors.